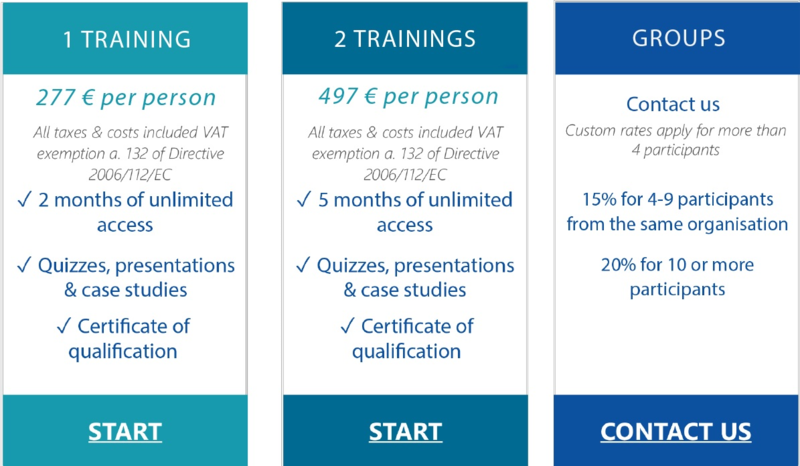 Equivalent to a 1-day face-to-face training, this online training includes 5 lessons devoted to concrete aspects of the results-based management of EU funds. All lessons include 2 topics: videos, presentations, case studies and quizzes. On-the-job training based on concrete examples. The training ends with a test that gives you a certificate of qualification (to score at least 60%). Available anytime, anywhere online, on your electronic devices with a possibility to follow it during working hours, getting approval from your supervisor (specific authorization). Discover now lesson 1 for free, without inscription, without payment! Choose the option that suits you best. Contact us for group custom rates, we’d be happy to find the best plan for your team.